Les Pierres Plates: (allée coudée). 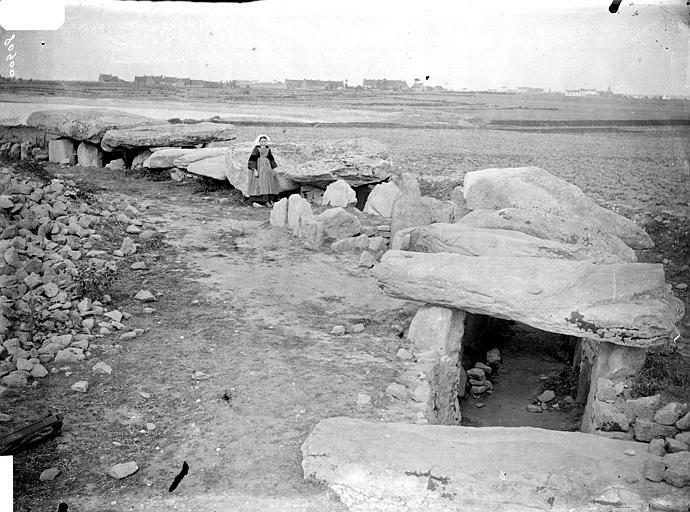 An “allée coudée” is a special type of dolmen; the corridor changes direction and slightly enlarges to form a chamber, sometimes separated from the corridor by an upright. 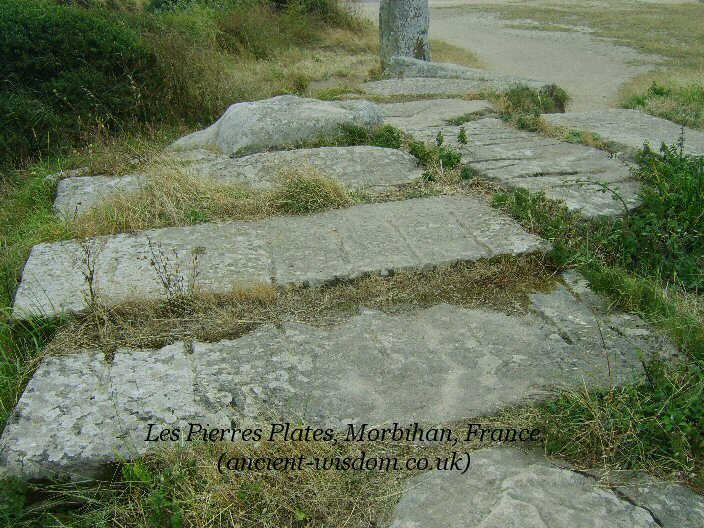 We know of only six in this area, the best known is Pierres Plates; the others are only rarely visited. They have two points in common: they are “bent” and they have carvings that resemble each other. 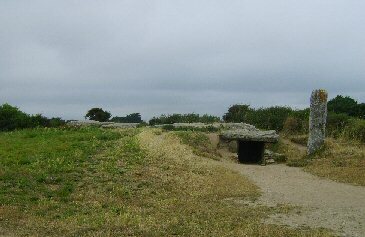 Around 3000 BC, these megalithic "elbow" or "angled" tombs began to appear all along the Morbihan coastline, in close proximity to the sea. Pierres-Plates, which stands at the southern end of the Locmariaquer peninsula, is one of the most beautiful remaining of these. Les Pierres Plates: ('The Flat Stones'). The monument was first explored in 1813 but the findings were disappointing because of previous incursions. Nonetheless, these early explorers noticed that several uprights were decorated, leading to the first real record of megalithic art in the Morbihan, published by A. Maudet de Penhouet in 1814. The decoration was frequently studied, but has since been broken up (at least one major panel disappeared) (1). 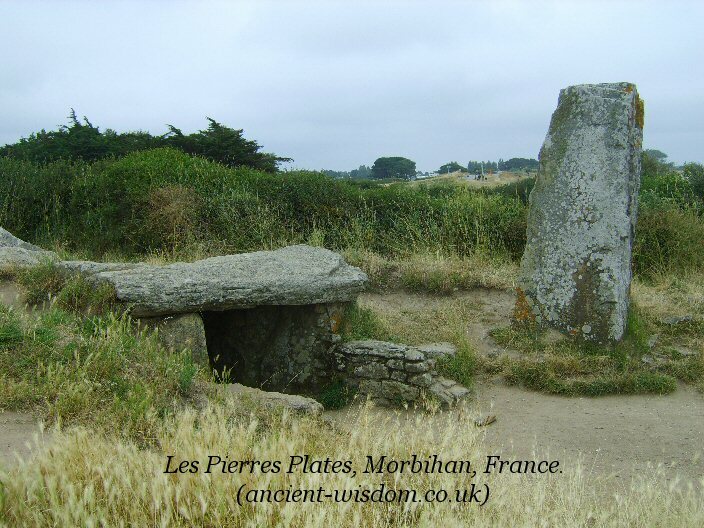 These studies provided the basis for the definition of the "Pierres-plates style" which is thought to characterize the Morbihan elbow tombs. As in other elbow tombs, walling is "mixed"; i.e. 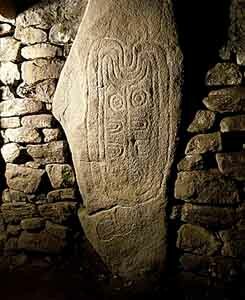 small stone-built panels contained between megalithic uprights. Of 38 pillars, 13 are carved with what is commonly referred to as anthropomorphic images. 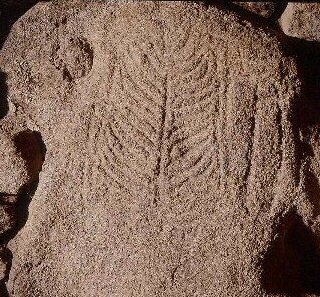 Early explorers noticed that several uprights were decorated, leading to the first real record of megalithic art in the Morbihan, published by A. Maudet de Penhouet in 1814. The top surfaces of several of squared blocks of granite have what appear to be long drill marks in them. These stones were probably added by Le Rouzic's restoration in 1931. 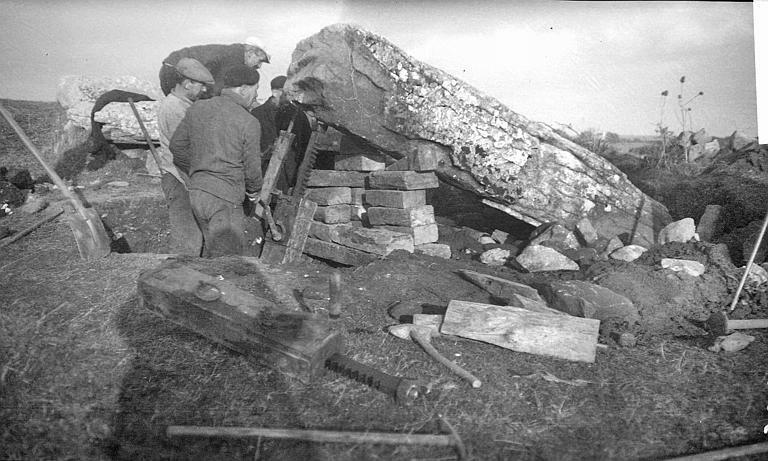 This early image shows no such stones, suggesting that they were added by Le Rouzic. The menhir standing at the entrance is a block that lay in front of the monument and was erected here by Le Rouzic when he carried out the restoration work. Its original role in the structure is not well known but it can be noted that its eastern face carries a large number of cup-marks. 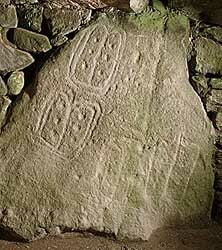 It can be seen in the following photo that the stone originally lay prostrate directly across the front of the entrance, offering a clear possibility that this was an original design feature. 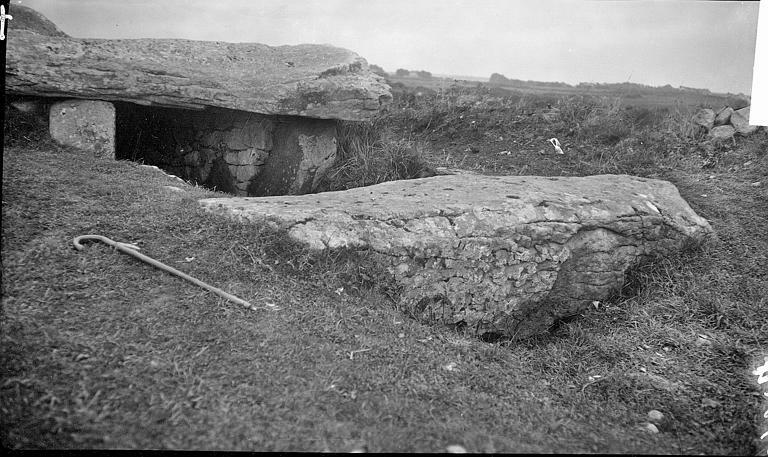 This early image shows the 'Indicator' pillar lying across the entrance to the structure. The 're-erection' of the Indicator pillar.